Stephanie and Heidi live a life of chocolate. 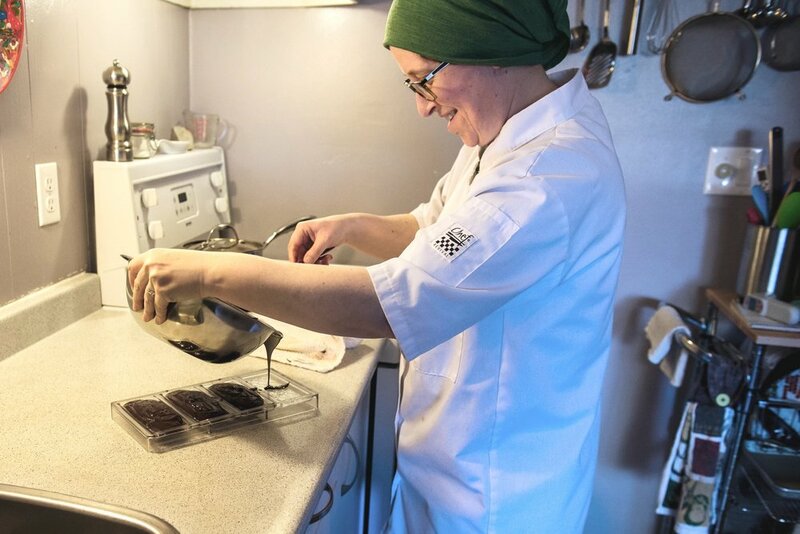 They are both long-term “Chocolate Concierge” at The Chocolate Project where they spend their days surrounded by some of the finest bean-to-bar chocolate this world has to offer. With their palates well refined, they began making their own chocolate in 2014. They started selling at a few local farmers markets, but quickly locked in regular booths at the Esquimalt Farmers Market and James Bay Farmers Markets. They love to share their enthusiasm for chocolate with people, so stop by and learn about chocolate (there will probably be a tasting involved, too!). It’s not bean-to-bar chocolate without the beans. We source fine-flavour cacao beans from small farms and fermenteries around the tropical world. We hand sort every bag of beans to ensure that only the best beans are used. We roast our beans to get the perfect flavour from our product. Every origin needs its own roasting time and temperature to get the very best flavours from it. Once the beans are roasted, we crack them to break them into pieces, and, through a process called winnowing, separate out the delicious cocoa nibs from the outer husks that cover the whole beans. After winnowing, the cocoa nibs are stone ground into liquid (like transforming nuts into nut butter). Sugar is added (or not, in the case of our 100% cacao bars), and the chocolate is conched to achieve the final, beautiful flavour profile. We temper all of our small batches by hand to get that perfect texture every time. Finally, the chocolate is ready to be moulded into a bar, packaged, and enjoyed by you.